Insects dominate this world. More than 70 percent of the described species on Earth are insects. What made them so successful? Their wing, says Yoshi Tomoyasu, associate professor of biology at Miami University. The wing made it possible for insects to fly and expand their territory and also acted as an evolutionary medium for ornamentation, camouflage and warning devices. But, we are still not sure where and how insect wings originated, Tomayasu said. In the last 200 years, scientists have been studying the origin of insect wings using various approaches, such as paleontology, taxonomy and morphology. 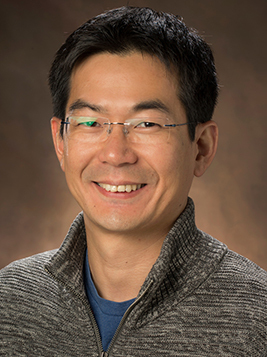 Tomoyasu uses a relatively new approach, evolutionary developmental biology (often called ‘evo-devo’) to tackle the centuries-old debate about the origin of insect wings. Recent research published by Tomoyasu and his students offers evidence of the dual origin of the evolution of insect wings — one of the three competing explanations for how insect wings developed. Tribolium life cycle poster by Tomoyasu. This type of basic science has direct connections with humans, Tomoyasu explained. “Counterparts of many genes we study (and a majority of insect genes) are also found in humans. These ‘evolutionarily conserved’ genes in humans often have critical roles in our development, behaviors and diseases such as cancers,” he said. 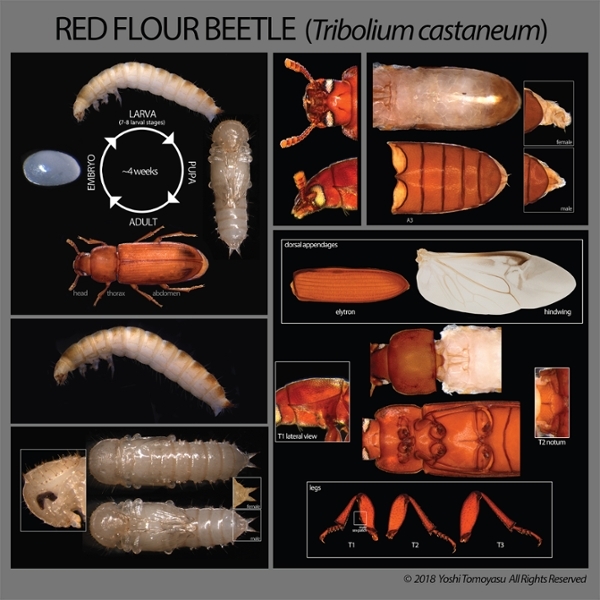 Tomoyasu and his lab group study the small red flour beetle, Tribolium castaneum. The beetle has a fully sequenced genome, it does not fly well and is easy to keep in the laboratory, making it a model study organism. “We use RNA interference gene knock-down techniques to make beetles grow wings where they are not usually found, to investigate how and where wings are formed,” Tomoyasu said. In recent studies, they found that two distinct types of tissues contribute to form a complete wing, supporting the dual-origin hypothesis. In a nod to the six-legged insect, six highlights of Tomoyasu’s research are presented here — and six fascinating facts about beetles. Among insects, beetles are the largest group — accounting for about 25 percent of all species on Earth — making them a very intriguing group of animals to study, Tomoyasu said. In a study published earlier this year in the Proceedings of the Natural Academy of Sciences, Tomoyasu and his colleagues "turned off" certain genes in Tribolium beetle larvae so that they would grow wings on their abdomen — a place beetles (or any insects) don’t usually have wings. 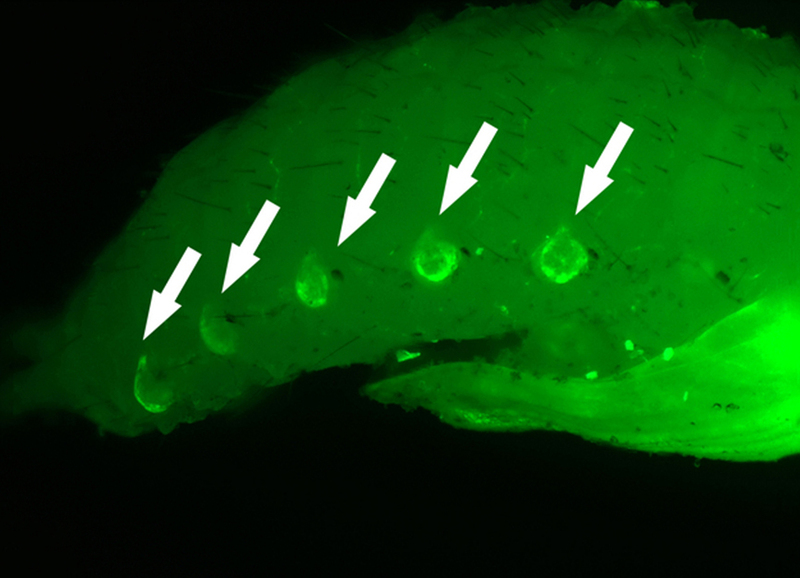 Arrows indicate abnormal wing tissue growths on the abdomen of a Tribolium castaneum beetle following knockdown of the Hox gene abdA (Linz and Tomoyasu). 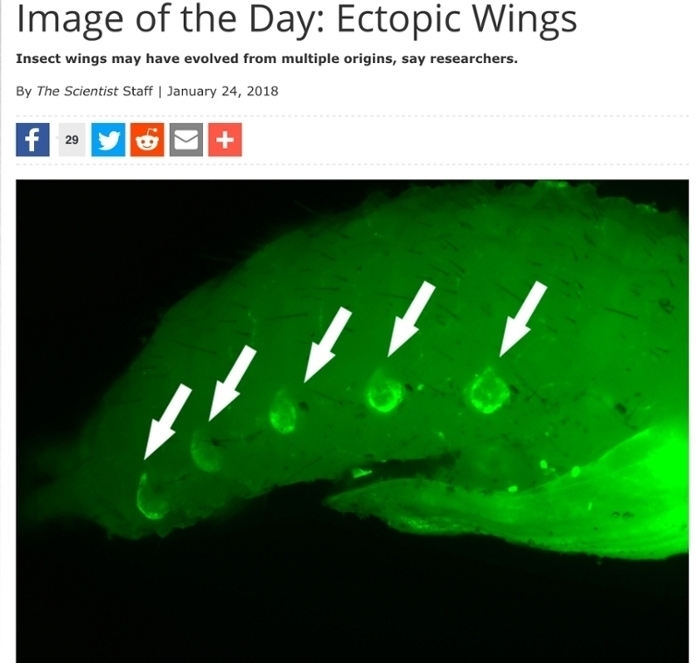 They discovered that a wing developed from two different tissues: tissue that has its evolutionary origin in legs and the tissue on the back side of the body wall. David Linz (Miami ‘10, Ph.D. ’17), former doctoral student with Tomoyasu and lead author of the study, said, “This outcome supports a dual evolutionary origin of insect wings, and shows that novelty can emerge through two previously unassociated tissues collaborating to form a new structure.” Linz is now a postdoctoral researcher at Indiana University. In the study, the researchers were able to actually trace which tissue actually transformed into wings. “To our surprise we were able to see two tissues merging, so from there, we concluded that, at least in beetles, wings are formed from two distinct tissues,” Tomoyasu said. A fascinating image by Linz was selected as an Image of the Day in The Scientist (see right). “We manipulated gene function and created a beetle with 12 extra wings,” Tomoyasu said. Left to right: Maddy Moe, Courtney Clark-Hatchel and Tomoyasu (photo by Jeff Sabo). “More recently, by taking advantage of some unique beetle mutants, we have created a situation in which wing tissues are formed even inside of the Tribolium larvae body,” Tomoyasu said. In the study, published in the July issue of Athropod Structure and Development, they showed that two distinct tissues can independently transform into wings, offering more evidence for the dual-origin evolution of insect wings. This study was led by Courtney Clark-Hatchel (Miami ’12, Ph.D. ’18) and senior bioengineering major Maddy Moe. Clark-Hatchel received her doctorate in August and begins a postdoctoral research fellowship at the University of North Carolina at Chapel Hill this month. The debate about how insect wings evolved is far from over, Tomoyasu said. “It’s crucial for us to study more insects and beyond. We’re now studying cockroaches, mayflies and crustaceans (shrimp) to see if the dual-origin process exists in a similar way, in other species," he said. In beetles, their forewings are converted into protective shields. Evolution of this shield, the elytron, was beneficial because it allowed beetles to explore various environments without losing their ability to fly, Tomoyasu said. Interestingly, few studies ever empirically tested the benefit of this shield. Tomoyasu and his students were among the first to demonstrate the benefit of this shield. Read about it here: Creative study on beetle forewings provides first compelling evidence of centuries-old theory. The study co-authors were Linz, Alan Hu (Miami ’16) and Michael Sitvarin (Miami Ph.D. ’14). 3. Beetles are found from Pole to Pole and every ecological niche. The smallest is the fringed ant beetle, at 0.01 inches (0.25 mm) long. The longest, Titanus giganteus, can grow to nearly 8 inches (20 cm) long. 4. The first true beetle appeared about 230 million years ago. And insect wings are thought to have appeared about 400-350 million years ago. But there is no fossil evidence that tells us how and where they have evolved, Tomoyasu said. Beetles chew their food thoroughly before swallowing. The common name beetle is thought to derive from the Old English word bitela, meaning little biter. 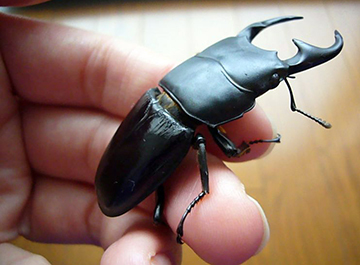 Keeping beetles as pets — especially rhinoceros and stag beetles — is very popular for kids in Japan, according to Tomoyasu. “The kids who can catch big beetles are cool kids in Japan,” he said. Yes, he was a beetle-collecting kid in Japan. “Insects and humans are so different, but I believe that knowledge of the history of life, including us humans, affects our way of thinking, our culture and our society,” Tomoyasu said. 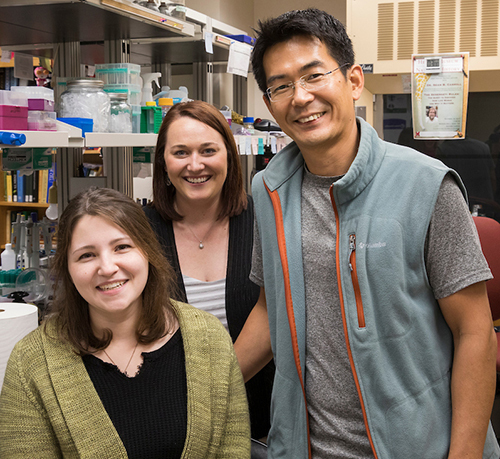 Read (six) behind the scenes highlights from Tomoyasu’s lab.